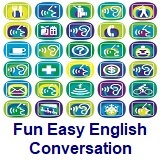 ﻿ Fun Easy English - new classroom free online classes english language lessons speaking listening writing reading april 20. 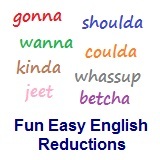 Today in the Fun Easy English classroom you are going to learn "doncha" an American English reduction. Roger: What do you do in your spare time? Barry: Oh, nothing special. I read… watch TV… go to the movies. Roger: Don’t you have any hobbies, like stamp collecting or things like that? Barry: No, I don’t have any hobbies. How about you? Roger: I have just one—photography. It’s expensive, but it’s a lot of fun. 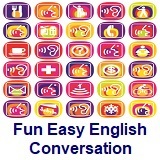 Meaning is leisure; extra time; free time. Meaning is no particular thing. I read. . . watch TV ... go to the movies. Notice the rising intonation on the first two elements of the series. A compound noun. Therefore the principal stress falls on the first word. Meaning is do you have any hobbies? This question How about you? 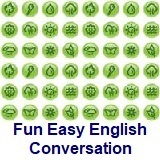 has the effect of directing the original question back to the other speaker.